The Hk VP9 debuted last year with rave reviews that were well deserved. After the success of their hammer-fired P30, Hk spent about four years developing the VP9. 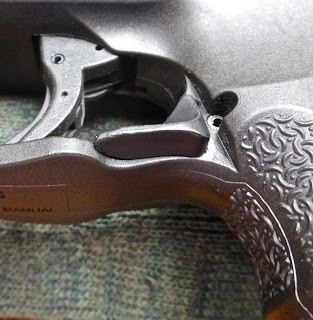 Now, Hk is not new to striker fired handguns. They developed the striker-fired VP70 way back in 1970 and introduced the innovative striker-fired P7 in 1976. It seems clear that Hk began with the superbly ergonomic P30 grip and built their new pistol up from that base. The nicely textured grip come with understated and generously proportioned finger grooves. 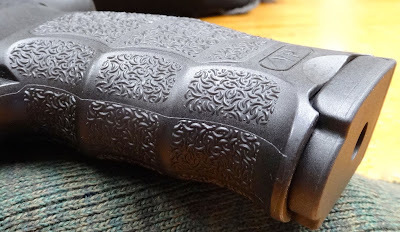 The grips also accommodate 3 different sized back-straps and six different side panels. It's highly probable that everyone can find a grip option that will fit their hand. The VP9 is completely ambidextrous with European-style paddle magazine releases on both sides of the trigger guard and slide stop levers on both the port and starboard side of the pistol. 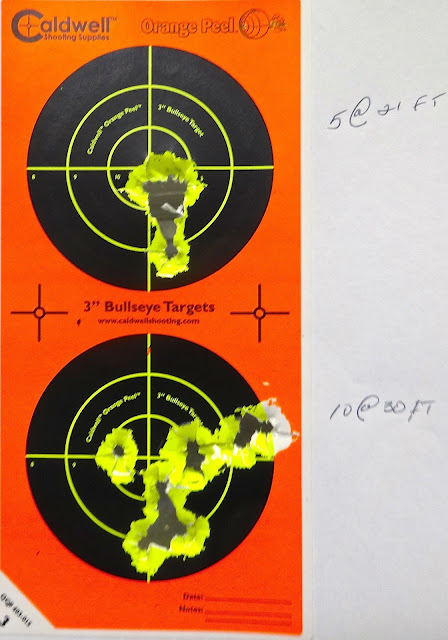 The 3-dot sights are made of a yellow phosphorous material that glows for about 30 minutes after being briefly exposed to intense light such as a quick blast from your flashlight. Now some ask why they just don't put night sights on them and the answer is simple; in many European countries private citizens are not allowed to own radioactive material, a small amount of which is necessary to get the sights to glow without any outside stimulus. 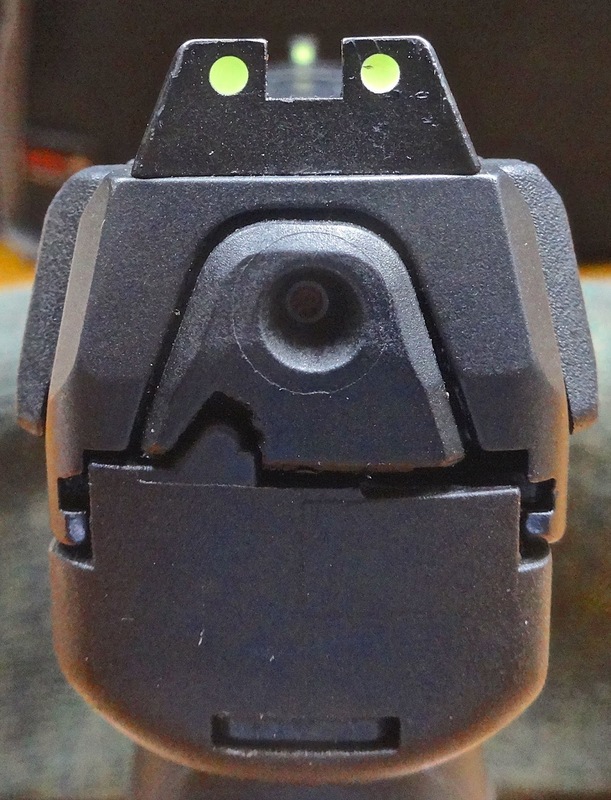 Another exclusive feature of the VP9 is the "winged" charging handle at the rear of the slide. This minor improvement greatly increases the ability of the shooter to get a positive grip on the slide and assists in racking the slide. The heart and soul of any pistol is the trigger. The VP9 benefits from from a 5.12 pound trigger pull which has minimal pre-travel and a crisp let-off. All of the prior mentioned features help provide very good accuracy. The target below shows 5 rounds fired into a 3-inch bullseye at 21 feet. The target underneath it shows 10 rounds fired at 30 feet. 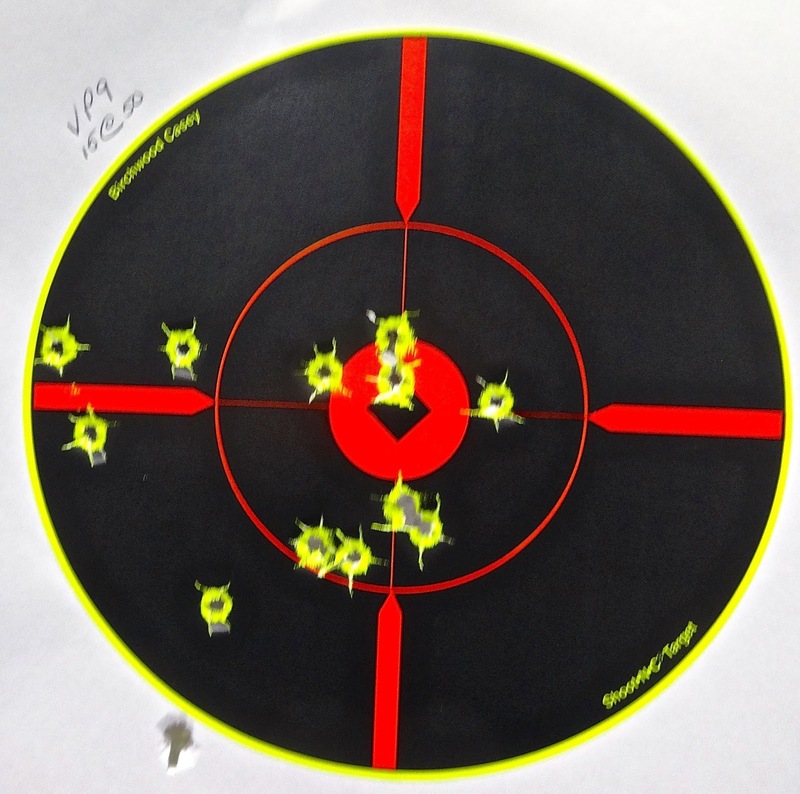 The next target is an 8 inch bullseye took 15 rounds fired at 40 feet. 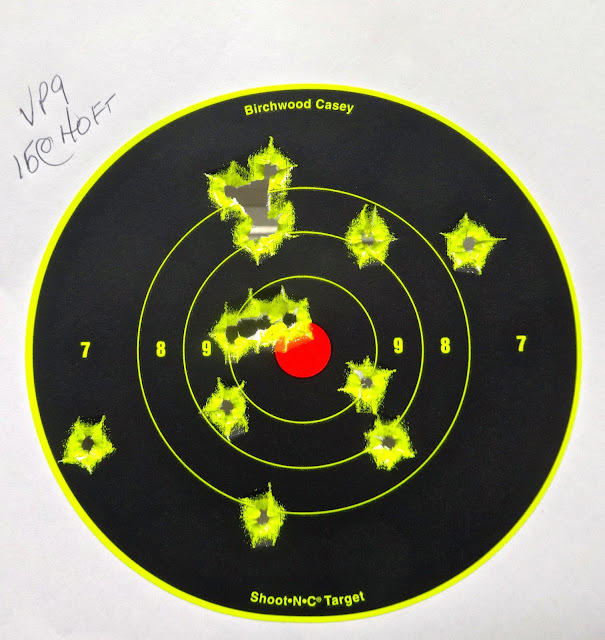 Our last target shows 15 rounds fired at 50 feet. I have saved the best feature of the pistol for last. 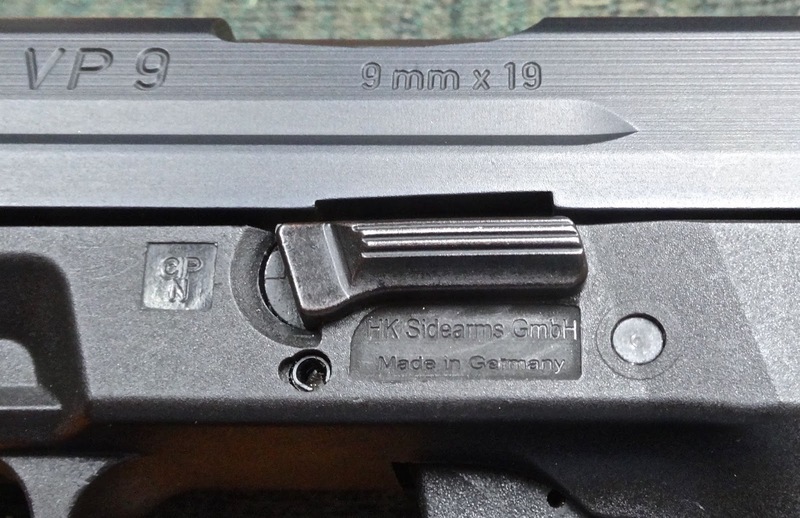 Hk firearms have long been expensive, too expensive for many people to justify when compared to the lower priced Glock, Springfield or Smith & Wesson M & P pistols. 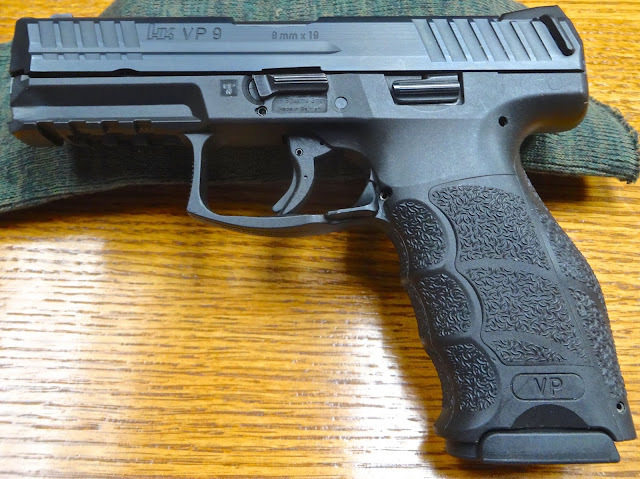 Hk has apparently realized this and priced the VP9 about 30% less than it's hammer-fired predecessor, the P30. When the P30 was first introduced I found it to be good pistol but not a great pistol. The VP9 takes it up and notch and makes this one Hk that will find a place in my battery.